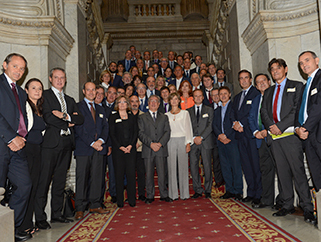 A total of 55 Autonomous and local administrations, business associations, manufacturers, distributors and waste managers, consumers and users, research groups and trade union and environmental organizations have joined the "Pact for a Circular Economy" with the which, under the auspices of the Government, are engaged in the elaboration of the so-called Spanish Strategy for Circular Economy (EEEC). It includes a set of actions in order to advance the transition to a circular economy. One of the entities adhered to the Pact is Humana Fundación Pueblo para Pueblo. Implementing a circular economic model is not only a mandate of the European Commission, but a key element to favor change from the linear economy in which we are immersed. This is expressed by the Ministry of Agriculture and Fisheries, Food and Environment (MAPAMA) and the Ministry of Economy, Industry and Competitiveness, which in September, 18 pushed a day to prepare the future EEEC. Humana applauded this initiative, aware that replacing the traditional model of linear economy (extract-produce-consume-pull) with a circular one is imperative for the sustainability of the planet. The Government will approve this Strategy after obtaining the contributions of economic and social agents, and after submitting the project to public consultation so that anyone can make suggestions. From the Government, they defend the "importance of incorporating the circular economy as a key element to favor the change towards a model of sustainable development, that allows to maximize the available resources, both material and energy, so that they remain the longest in the productive cycle, reduce the generation of waste and make the most of those that could not be avoided ". The Minister of Agriculture and Fisheries, Food and Environment, Isabel García Tejerina said during the presentation of the Pact that this change in the production model must have the involvement of public administrations, productive sectors, civil society and citizens . "This challenge calls us all, nobody can stay on the sidelines," he insisted. The pact commits to promote the transition to a circular economy through a decalogue of actions, including "to promote the effective implementation of the principle of hierarchy of waste, promoting the prevention of its generation, promoting reuse, strengthening recycling and favoring its traceability. " An action that fits perfectly with the work of Humana. 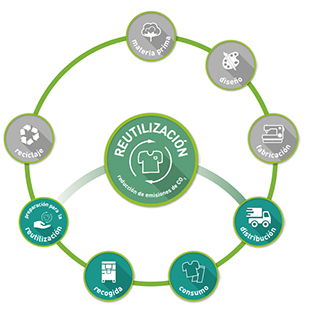 The preparation for reuse, recycling of textile fibers and energy recovery of clothes that can not be used are the main characteristics that make it possible to apply a circular economy model to the management of the textile used. The Foundation focuses its efforts on reuse because there is no more sustainable garment than the one already manufactured. And it has been doing it since 1987, that is, for 30 years, which puts the management of used clothing at the forefront of circular economy. Humana manages to value more than 90% of the textile that it classifies: 9 out of 10 used garments are likely to have a second life through reuse or recycling. Therefore, by applying an appropriate management in the last part of the textile life cycle, it is possible to reintroduce it into that cycle, either as secondhand clothing or other products. Circular economy in its pure state.